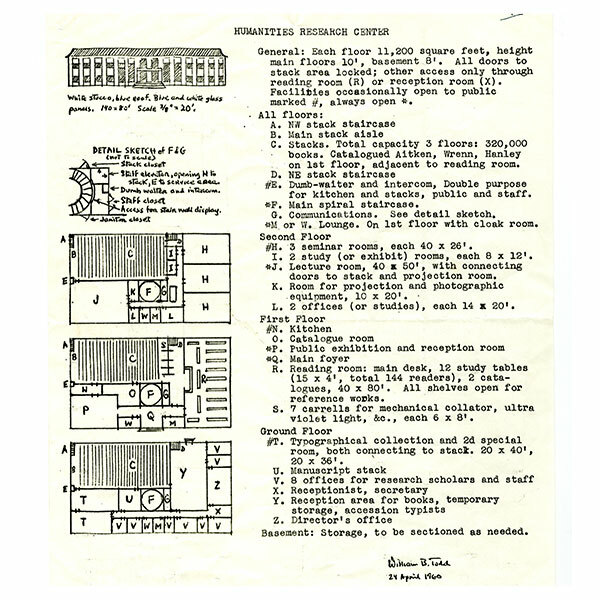 Building plans from the 1960s show concepts for office and classroom arrangements for housing the Rare Books Collection, the foundation of the Harry Ransom Center. The renderings were drawn by Professor William B. Todd (1919–2011). In 1958, Harry Ransom appointed Todd to become the bibliographic intelligence behind the newly envisioned Humanities Research Center. Later known for his discoveries about the forgeries by Thomas J. 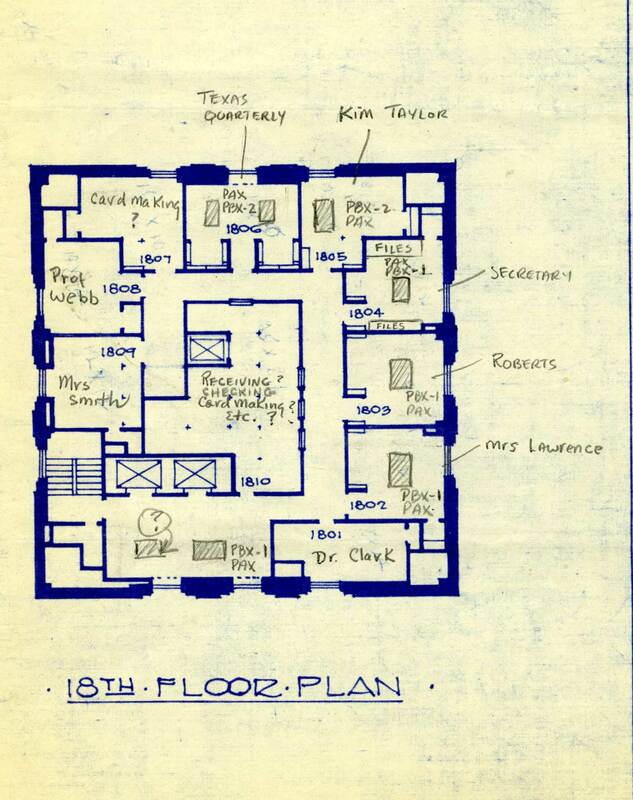 Wise in the Wrenn Library and for helping to select the perfect Gutenberg Bible for acquisition (Carl Pforzheimer’s, as it were), Todd spent some of his earliest time at the Center imagining new library layouts and building plans for the growing research library. The blue and white print shows a proposed arrangement for administrative offices for the Humanities Research Center in UT’s Main Building Tower. It would house receiving, cataloging, and staff spaces to support the growing collection of research materials and rare books, which the public accessed in the building’s lower floors. The black-and-white drawing (top), dated April 24, 1960, is a proposal for the new building, situated on the Ransom Center’s current site and facing north toward Sutton Hall and the School of Architecture. It visually matched nearby buildings in the Spanish-Mediterranean Revival style. Both designs illustrate the continuous growth and change in space allocation, administration, and collections storage. Ultimately, the Humanities Research Center’s new building—what exists today—was designed and built in the Brutalist style of the late 1960s. Sixty years later, the Ransom Center is again making plans to redesign its spaces for the future. This story originally appeared in our Spring 2018 issue of Ransom Center Magazine.